Ghost face from the classic 1996 movie Scream stands in a menacing way. Photo courtesy of www.bing.com. To many, October is a special time of year. It ushers in the feelings of autumn, along with a beloved holiday. For teens, it’s typical to spend Halloween either at a party or watching horror movies and eating junk food. Sadly, after another year of school shootings, some teens are beginning to feel like their lives have turned into a horror movie, with constant anticipation for a tragedy that might occur. As this threat looms, a realization becomes clear — in today’s world, slasher movie characters are more likely to survive than kids who attended school in 2018. 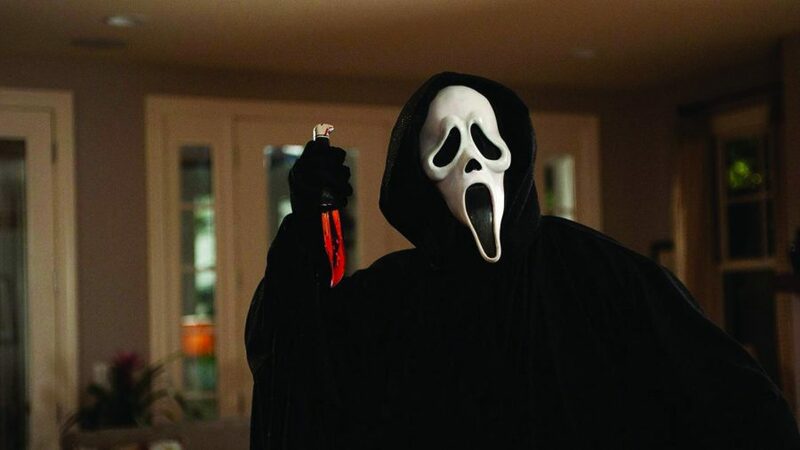 In all four Scream movies, first released in 1996, combined characters such as Billy Loomis, his best friend Stu, Mickey, Mrs. Loomis, Roman Bridger, Jill Roberts and Charlie Walker committed approximately 34 murders, according to Wikia.com. This does not include characters’ deaths by self-defense or accident. The Scream movies never really got fabulous reviews, especially the sequels, but they were chosen in this comparison for a reason. In the first movie (1996), the main character is a high school kid who murders his classmates and community members. In the second film (1997), it’s a college kid killing his classmates. The third movie (2000) features an angry sibling, and in the fourth movie (2011), the focus turns back to the high school kid. Comparing the years, with school shootings contrasted to the number of Scream murders in each movie, the numbers speak for themselves. In 1996, when the first Scream movie was released, the movie contained five murders by the killer(s), not including self defense. That year, there were two school shootings and six fatalities. The second movie, released in 1997, had eight murders. There were four school shootings that year with another six fatalities. Three years later, in 2000, there were nine murders in Scream 3, with four school shootings that year with five deaths. Over a decade later, when Scream 4 was released, it contained 12 murders. In 2011 there were five school shootings with a total of three deaths, according to TribLive.com and USNews.com. Taking a look at the numbers from the74million.org, one can see that in 2018, there were 41 people killed in school shootings across the nation. In the Scream franchise, a total of 34 characters have been murdered. That is a difference of 20 percent, meaning American students in this year have had a 20 percent worse survival rate than the characters in four violent horror movies. For all the school shootings in 2018, the gunmen were currently enrolled in the school, or had been enrolled in the past. In the shootings, they murdered classmates, teachers and other school staff. The similarities here are eerie: A disturbed and angry teen believes people have wronged them, and comes to school to get revenge. The difference? The movies are fiction. But school shootings are all too real in the lives of American students today. There was a time when teens could watch a scary movie and fear that fictional murderer hid in their closets, or behind their shower curtains. Now the fear is that there may be a murderer in the desk next to them.